The Aero-Tex Fly Zip Liner is made here in the USA custom, for any sized rider. 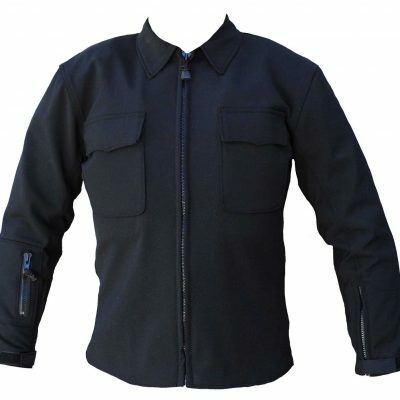 This liner is designed to fit the Police Kevlar Pant, Air Mesh Kevlar Police Pant, Kevlar Street Jean and the Air Mesh Kevlar Jean. 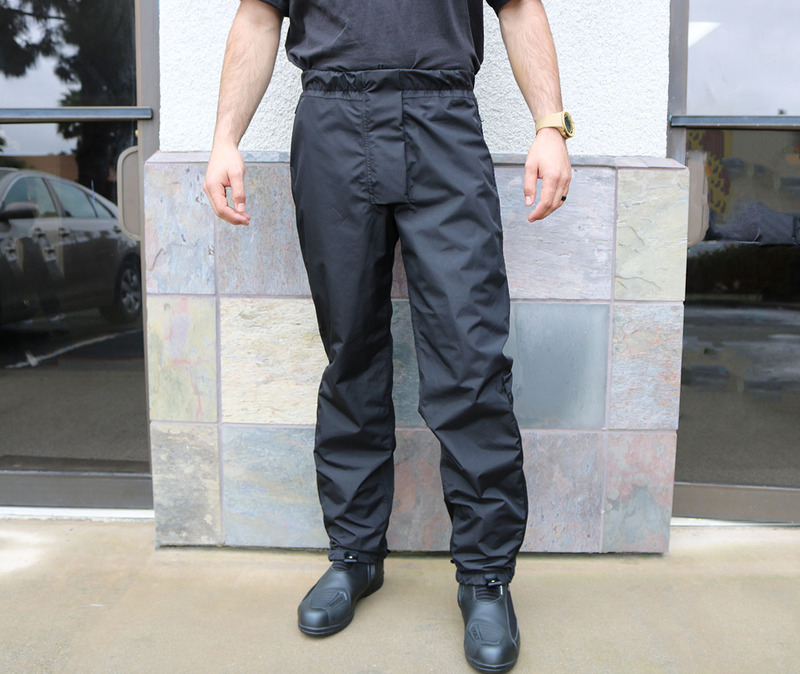 Our new Aero-Tex Liner is the first Waterproof/Windproof/Breathable pant that has no Polyurethane coating on the face fabric. 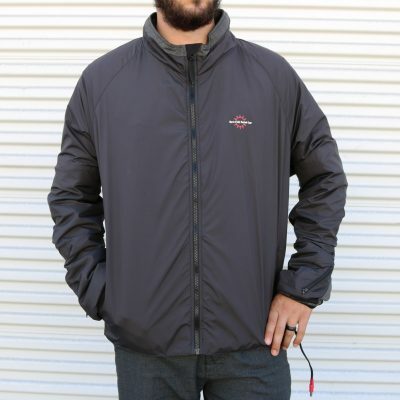 This allows the rider to get far better breathability in the warmer weather. (See Polyurethane in our Dictionary) Materials made with Gore-Tex and other breathable membranes are coated with Polyurethane (plastic) that degrades the breathability in the warm temperatures. Most riders can go into the low 40F up to 90F with the liner under the Police or Air Mesh Kevlar Pant on a bike without a fairing. With a windshield it is possible to ride down into the high 20f range. With good Thermal underwear underneath with the liner zipped in it is possible to ride in sub zero temperatures. All waterproof/breathable membranes pull the heat and moisture away from the body better when worn close to skin. Our long distance touring riders wear both the jacket and pant liners in a sleeping bag or walking around the campground on cold nights for comfort. 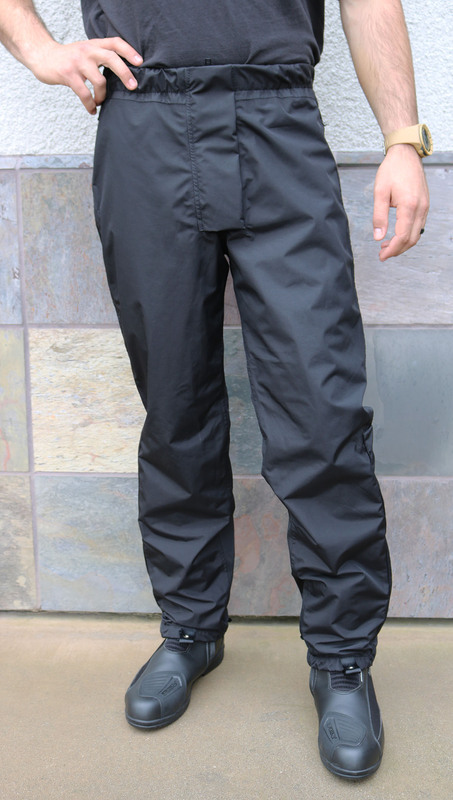 The liner attaches quickly with a short zipper inside back below waist with snaps at cuffs. Install and remove in seconds. For quick on/off it is not necessary to zip in the liner. In some areas it is possible just to leave the liner zipped in for 6 or more months of the year. A common question is: “What if it’s hot and raining and I want to stay dry”? The liner can be left on even in warmer weather. You will still be more comfortable than any other Waterproof/Breathable/Windproof pant in the world. Without any Polyurethane coating on the outer suit material, the Aero-Tex can perform better. When its over 85F and raining, most riders prefer not wearing the liners. Our gear doesn’t absorb any water and will be dry in minutes after a rain. Some riders comment that they don’t like the outer shell getting wet when the waterproof liner is on the inside. The uncoated outer pant material completely dries in less than five minutes when riding. With the majority of other suits the outer Polyurethane coated shell gets wet before hitting the waterproof membrane. The Polyurethane traps the water, sometimes taking hours to dry. “See Polyurethane in the “Dictionary,” to learn of all the other problems it causes. Our gear doesn’t absorb any water and will be dry in minutes after a rain. Note: If your gear is absorbing water, part of maintenance is to spray the outer shell with Fabric Guard 303. Some riders comment that they don’t want to remove the pant to put on the liner. The majority of riders put on a rain suit after it starts to rain. 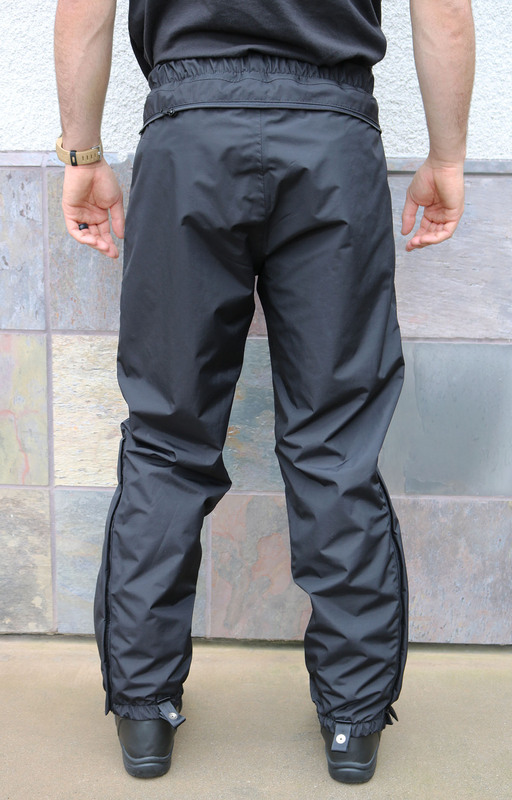 Trying to put a rain pant over a wet riding pant is by far more difficult than simply removing the pant in seconds, slipping on the liner, and then putting on the pant over the liner. It is not necessary to zip the liner into the pant for quick on off situations. Outer rain gear has a short life span. If you hit a branch or simply fall off the bike when on the kickstand a rain suit can rip. Touch an exhaust pipe and the rain suit will melt. Many of our riders crash wearing the Aero-Tex Rain Liner with no damage to the inner liner. No need to worry, especially on long trips to have rain gear fail. Expect to get many years of optimal performance from our Aero-Tex Liners. 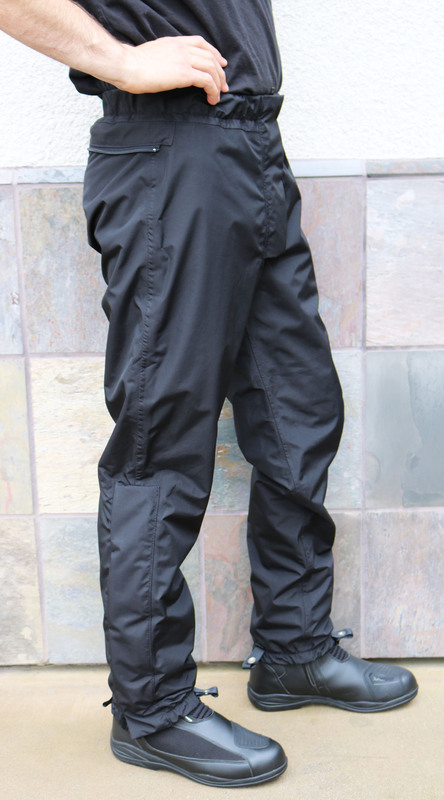 • Zipper/Velcro/Double flap creates a three way seal to waterproof the crotch zipper. • Can be worn alone. • If this liner is not ordered with any of the Police Kevlar Pants or Kevlar Jeans, it will be necessary to return these pants to build the liner. Both the Kevlar Police Pants and Kevlar Jeans are built custom from sending in the riders denim pant to use as a pattern. The jean that was used for the pattern is returned to the customer. If you call in to place the order we will provide shipping instructions. If you place the order on our web site we will email the shipping instructions to you. • Repairs or alterations can be made. • Depending on the time of year it usually averages three to five days to make the pant liner. Please call for more accurate ship dates.